Southern Province, Sri Lanka – Lochana is 10 years old. Every morning, he gets up and lights an incense stick, which he places in a three-wheeled auto-rickshaw parked outside the family home in Sri Lanka‘s coastal Southern Province. The vehicle is a bright shade of pink and as the fragrant smoke fills the interior, Lochana says a prayer for his mother’s safety and prosperity. Jega raised Lochana as a single mother. She is the family’s sole breadwinner and works hard to keep them afloat. She used to work as a labourer on a road construction site and a factory worker grinding rice flour. She now drives a tuk-tuk, or auto-rickshaw. Men comprise the majority of auto-rickshaw drivers, but Jega is happy to challenge a few stereotypes in exchange for a steady income. The 43-year-old did not imagine she would have to work so hard. As the daughter of a wealthy mechanic, she had a privileged childhood and when she got married to her partner, Siriarshan, her family settled a hefty dowry, which included a seven-bedroom home. However, both of her parents died after the wedding, leaving Jega in a vulnerable position. Before Lochana was born, Siriarshan abandoned his young family for another woman. He also sold everything Jega brought into the marriage. As she attempted to track down Siriarshan and claim child support, Jega was housebound with her infant and relied on handouts from her relatives, existing on as little as 500 rupees, or $3, a month. During that time, she and Lochana ate nothing but lentils ground and boiled into a thin soup. A decade later, Jega is now independent. She receives Rs5,000 ($30) per month in alimony and supplements this with the income from her pink tuk-tuk. Jega drives it daily, but her passengers are never single men or men in groups. She offers transport to children, women or families. Having ridden for just a few months, she already earns enough to pay for the tuk-tuk’s daily rental and fuel costs, and still has some extra money. The little three-wheeler belongs to the Rosie May Foundation, an organisation which leased it to Jega at a nominal rate after helping her get her licence. But the scheme is not charity: drivers pay for training and the money they pay to rent the tuk-tuks goes towards maintenance. It is one of several programmes by the organisation which supports children and single mothers in Sri Lanka and Nepal. Project manager Ramani Samarasinghe says the women are referred by social services or police, and that they tend to be in difficult personal circumstances. “Often, the man is the sole breadwinner in the family and suddenly when he goes, the wife feels lost,” she says. According to the Household Income and Expenditure Survey 2016, just 25.8 percent, or 1.4 million households, are headed by women. In Jega’s experience, social attitudes are discriminatory. “When they see a single woman, the community always tries to suppress you,” she says, adding she worries for her physical safety. On public transport, “men will come and poke you or say things to you”, she explains, describing routine harassment. A United Nations Population Fund study in March 2017 found 90 percent of Sri Lankan women endure sexual harassment on public transport. None of this is news to Deepthi Priyadarshini, a 52-year-old widow who also drives a pink tuk-tuk. She misses her husband of 20 years and worries about her daughter’s safety. Men from the neighbourhood, she claims, knock on the door asking for sexual favours. 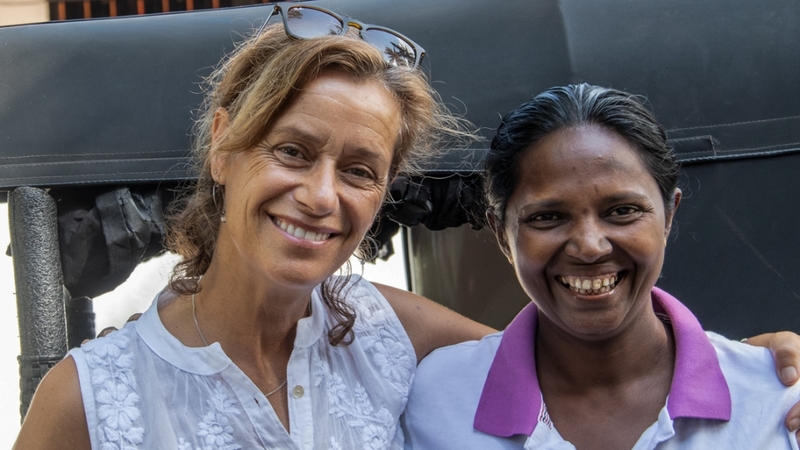 “Sri Lanka can be a very difficult place for a woman alone,” she says. She began driving in January. In less than half a year, she has already secured 10 regular clients. “Their parents know I take care of them like a mother,” she says. The foundation was named after 10-year-old Rosie May, a British girl who was murdered by a 17-year-old boy she knew, at a Christmas party in Leicestershire in 2003. Her parents Mary and Graham Storrie set up the organisation. “We realised we knew the full pain of what it was like to lose a child, and this gave us the empathy we needed to be able to do this work,” says Mary. 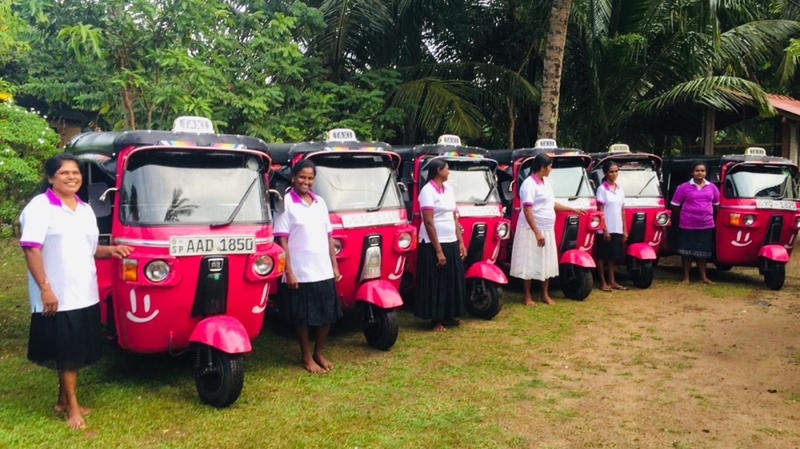 There are now nine pink tuk-tuks out on Sri Lanka’s roads. But one of the biggest challenges has been finding women to enter a male-dominated field. “We need people who are willing to step out of their comfort zones,” says Mary. On March 8, International Women’s Day, the women took the tuk-tuks out on a parade to mark. Deepthi smiled and waved as they drove through small towns crowded with tourists. Published in Al Jazeera on March 20, 2019. By Smriti Daniel.